Forget warming by the fire in this chilly weather, the heat was on full blast as the Dragons returned to the Den tonight. In a way, it seems fitting that the show featured a lot of clothing businesses, so I thought I’d look at some clothing related IP. First in was Alison Stevenson with Clean Heels – a clever little device that stops stilettos sinking into the ground outdoors. Looking for £50k investment for 15% equity, it seemed a big ask for such a small and simple-looking innovation. Having been in this disastrous situation last summer at a wedding, she had me hooked from the start. And it seems that I wasn’t the only one. Watching Deborah Meaden strut around on the makeshift Den lawn, it was obvious she was taken with the product. I have a UK patent and trade marks in the UK, Europe, Australia, New Zealand, South Africa and the United States. The base is a hard base and you’ve got the material on the top which is soft, so it protects the snap fitting of it and the shape. Owning this patent means Alison can stop others from making and selling her product without her permission. Alison’s thoroughness in protecting her product sealed the deal with two Dragons – proof that IP does make a difference when it comes to getting investors on board. Of course, not all clothing innovations are patentable but there are still ways in which you can protect them. For example, take ‘megging’ entrepreneurs Tom Hunt, Luke Shipley and Joe Hollingworth. They did little but amuse the Dragons with their “ridiculous” clothing. As leggings have been around for decades, there’s definitely nothing new there they could patent. But many products that aren’t considered patentable could be protected with a registered design. This won’t protect how something works but it can protect the way it looks, including its shape, material and pattern. In this case, if the legging patterns are unique, these fashion forward young men could register the designs to keep themselves one step ahead of the competition. My initial reaction to Nicky Fletcher and her hi-vis clothing and accessory company, Equisafety Ltd, was that this wouldn’t light up the Den. But she proved me wrong, securing the £100k investment she wanted. The company makes clothing and accessories for the equestrian, cycling, motorbike and canine markets. Currently selling worldwide, her success made an impression on the Den. 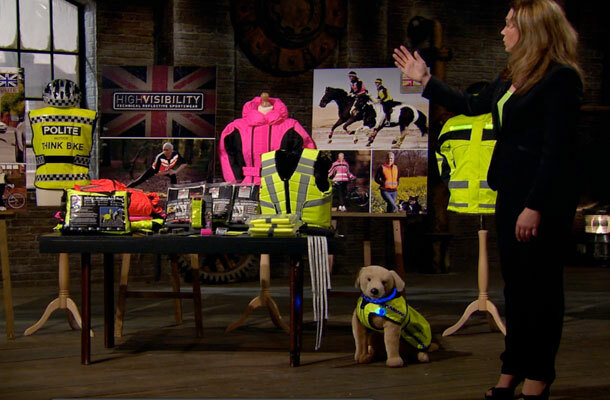 Nicky Fletcher and her hi-vis clothing and accessory range. One concern I shared with Kelly Hoppen was over the appearance of her ‘Polite’ range, which looks like police clothing. The design guru questioned whether Nicky had experienced any problems with the police because of this. I thought of the idea in 2010 and I went to ACPO and asked if it was ok. I gave them an array of designs and they said it was fine. There’s no way I would be pushing this if it was illegal. Checking for objections and obtaining permission was a clever move. It’s important to do all you can to avoid any possible IP issues. IP infringement, whether done knowingly or not, can have serious implications. This could be anything from using a logo which is almost identical to a well-known brand or promoting sub-quality goods with a name that could be misleading to customers. In the worst cases, it could even end your business. You can minimise the risk of infringing someone else’s trade mark by carrying out a trade mark search on our website. Congratulations to all the entrepreneurs who entered the Den tonight, especially those who secured an investment. Whether it’s for a hat or hydraulic hose, you can find out more about how to protect your ‘IP for Business’ with our free, online support tools.